In June 2017 Jocelyn Kane participated in this workshop for academics working on issues concerning statelessness. The event explored how scholars have approached statelessness in the past and how we can engage with statelessness in a multidisciplinary way going forward. This intensive week-long programme of activities for academics included an exchange of experiences on teaching statelessness, a dialogue between scholars and practitioners, masterclasses and workshops, and a two-day meeting of over twenty expert academics and practitioners in the field. 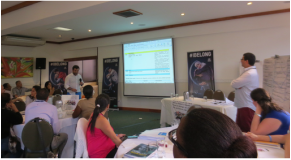 In June 2016 CCS attended the Training Workshop on Nationality and Statelessness for Non-governmental Organizations and Legal Clinics of the Americas. The workshop addressed the international and regional legal framework on statelessness, jurisprudential developments of the Inter-American Human Rights System, and best practices in order to strengthen capacities of NGOs and practitioners to contribute to the implementation of the sixth chapter (Statelessness) of the Brazil Action Plan. In December 2015, CCS Director Jocelyn Kane had the privilege of participating in the Global Ideas Institute seminar series on Birth Registration, and presented the ‘Human Side of Birth Registration’ to 25 groups of Toronto high school students. These young minds attend seminars throughout the year and are tasked with coming up with a project that tackles the various challenges of this global problem. For more information on the Global Ideas Institute, click here. In June 2015, the Office of the United Nations High Commissioner for Refugees, the Center for Justice and International Law, and Open Society Foundations organised a regional meeting of the Americas Network on Nationality and Statelessness and other non-governmental organisations. CCS was at the meeting, which aimed to enhance the function of the Americas Network and discuss the role of civil society organisations in implementing chapter six (Statelessness) of the Brazil Plan of Action, and the UNHCR Global Action Plan to End Statelessness: 2014-2024. For information on the Americas Network on Nationality and Statelessness please visit http://www.americasns.org/. For photos click here. In September 2014, CCS Director Jocelyn Kane participated in the inaugural Global Forum on Statelessness in The Hague, The Netherlands. Co-hosted by Tilburg University and the United Nations High Commissioner for Refugees, the Forum brought together experts, practitioners, and researchers to share good practices and challenges in policy development on statelessness, explore and debate contemporary statelessness research and policy, and provide a platform for the voices of stateless persons in the development of new research and policy directions. For the Forum programme, abstracts, and photos click here.